Once inside Outlook Express, click on the Tools menu and select "Options". When the Options dialog opens, click on the Compose tab. To customize the default email font, click on the first "Font Settings" button. 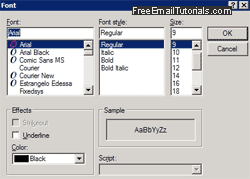 Outlook Express will open the standard Windows Font dialog, which lets you configure the following options: under Font, pick a font family you'd like to use. Since you never know what font others will have installed on their computer, you can either stick to a standard choice like Verdana, Arial, Times New Roman, Georgia, etc. - or pick your absolute favorite and keep in mind that your email recipients may see an alternate font if they don't have it on their system. To increase or decrease the text size, pick a number (in "points") from the Size scroll box; we recommend a minimum of 9 points font size for legibility, and a maximum of 11 or 12 points - this depends of course on the font family you chose, but reading email messages with a tiny font size or too large one can be quite annoying. Finally, Outlook Express lets you make the text automatically underlined, which we don't recommend, since underline distinguishes clickable links online - thus uselessly creating confusion if your entire email text looks like a link. Under the Color dropdown menu, you can also choose a default text color for your emails - we recommend a dark enough color to keep your email body text easily readable - you may need to many change font color if you are using a stationary, whose background color might km your default text color hard to read. Click on the OK button to accept your new font settings; then, click on the Options' dialog OK button to return to Outlook Express and test the new text options you just configured by composing a new test email message. From this point on, all new messages you compose from Outlook Express will automatically use your new default font, which you can manually change on an email by email basis! Tip: if you do not see any difference, you may have previously configured Outlook Express to use plain text for emails - go back and restore the original text setting to see your new font and formatting options.